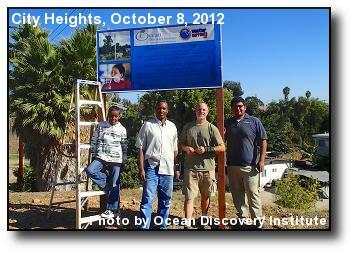 Weather Sign: Volunteers place a sign marking the City Heights weather station at Ocean Discovery Institute's future home. Photo courtesy of Dennis Wood. 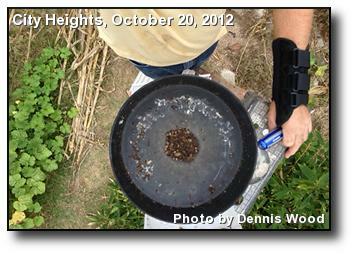 Rain Gauge Clog: Bird droppings in the City Heights rain gauge slowed down some recent rain recording. Photo courtesy of Dennis Wood. 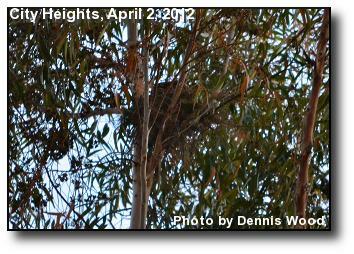 Hawk's Nest: A large nest owned by a pair of Cooper's Hawks sits in this eucalyptus tree, 100 feet above Manzanita Canyon. Photo courtesy of Dennis Wood. 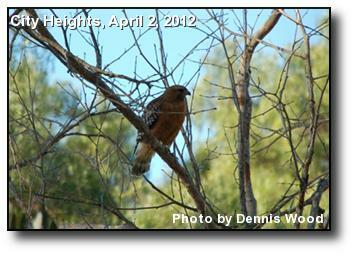 Cooper's Hawk: One bird of a nesting pair in the eucalyptus trees above Manzanita Canyon. Photo courtesy of Dennis Wood. 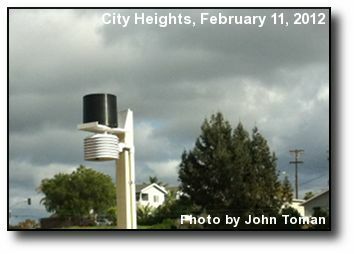 Local Weather: A new weather station will capture the climate at Ocean Discovery Institute's future Living Lab in City Heights. Photo courtesy of John Toman.